As much as I have been excited to play with the Joy-Con, VOEZ made heads turn when it was revealed to become the first game on Nintendo Switch that was only playable in Handheld Mode. Given that the fanfare that has surrounded the console has been that players can freely switch between three play modes, it is certainly encouraging to see that Nintendo doesn’t appear to be enforcing that as rule upon developers. And, with the company seemingly not wanting to really talk about the console’s touchscreen, the rhythm game can be seen as the first real test for that input method. Whether it be thanks to the game’s origins on mobile, the result is really quite spectacular. VOEZ serves up more than 100 tracks for you to play, plucked from genres that include trance, electronic and pop music. Each can be played on three increasingly challenging difficulty levels, with the player also free to choose how quickly the input prompts fall down the screen. As can be expected, players must perfect their timing to react to each prompt as it reaches a specific bar at the bottom of the screen – scoring more points depending on how accurate they are. There are four gestures that you will be required to perform: Tap, Hold, Slide and Swipe. The notes that fall are scattered across multiple lanes which shift in response to the music and your interactions. 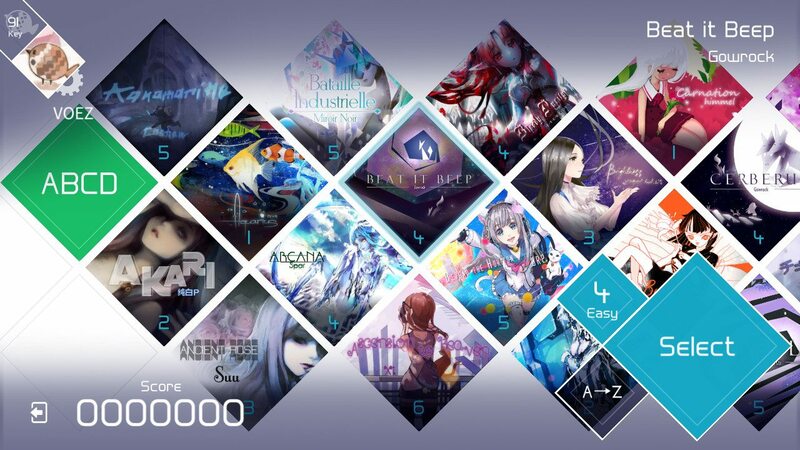 It is in simplicity that developer Rayark Games scores early success, with these gestures neatly summed up in a 26-second tutorial before you are thrust into selecting your first track from an admittedly overwhelming menu. It would have been preferable for the game to be structured in a way that the tracks were easier to tackle, but instead, it simply offers to categorise the tracks by name or difficulty level. There is a story that is loosely strung around the experience, with each track that you complete unlocking a Diary entry. These are simply anime-style illustrations or a dialogue interaction with other characters, which centre on six high school students from Lan Kong Town that form a band and eventually become international superstars. Given that it isn’t particularly well integrated with the game, you will find it hard to care about what you unlock – but the illustrations certainly are luscious. 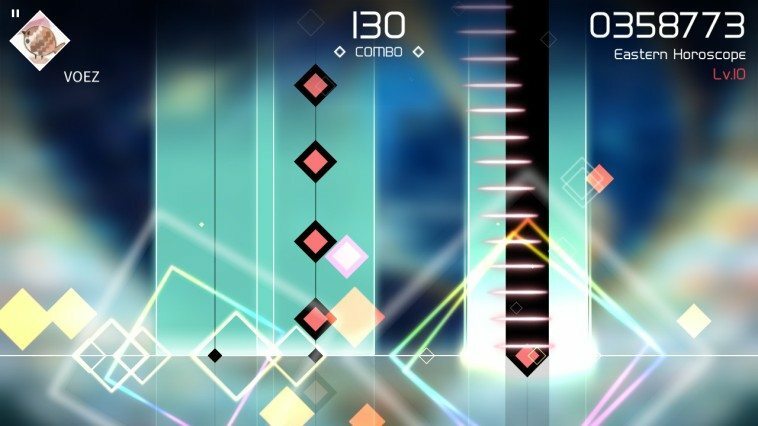 Minimalist in style, VOEZ mesmerises with a colour spectrum that is rarely encountered in games these days. But it is the music itself that will captivate most, every track penned by independent artists and composers from East Asia. The Nintendo Switch version carries a high price, especially in comparison with the free-to-play model that was used on mobile. The microtransactions have been removed entirely though, meaning that you have access to an exhaustive library of tracks without having to worry about spending another penny. With plentiful content in a range of energetic music styles, VOEZ astounds and enchants in equal measure to deliver a rhythm game that deserves your attention.